YELLOW CUSTARD APPLE: The custard apple comes in red and yellow and is a close relative to the sugar apple. 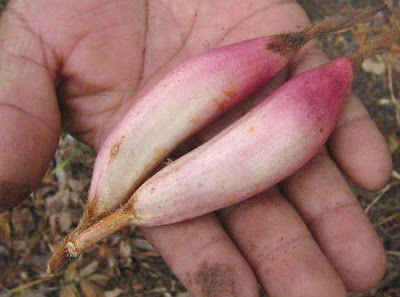 They have a thick creamy pulp that can be pink or white. This fruit has a very pleasant flavor and can be eaten as is or in ice cream. In Crooked Tree we love it lightly mixed in condensed milk and cinnamon. MAY PLUM: The may plum is a fast growing plant that can produce fruit in one year. 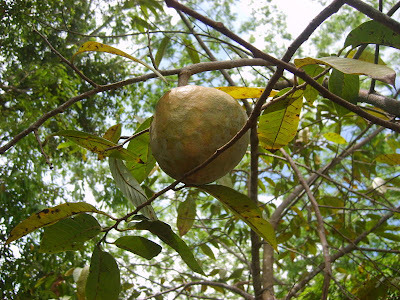 They are often eaten fresh from the tree, and can be made into jellies or drinks, the taste is somewhat like an apple. Inside is a single spiny seed. CASHEW FRUIT or APPLE: Some say the actual fruit is the nut, but for us in Crooked Tree it is not. The Cashew season is in April and May, and just about now all the trees are blooming. 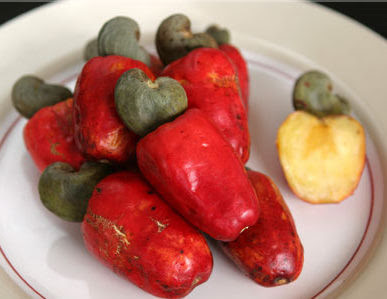 Cashew fruit can be eaten fresh from the trees, candied or stew. They have a sweet and astringent taste. 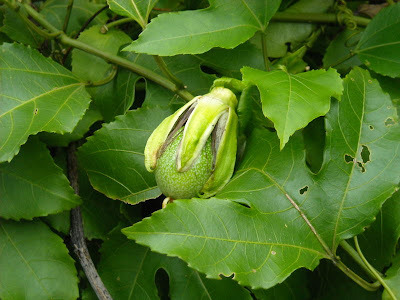 The nut should be roasted outside because of its oil, it can irritate the skin. 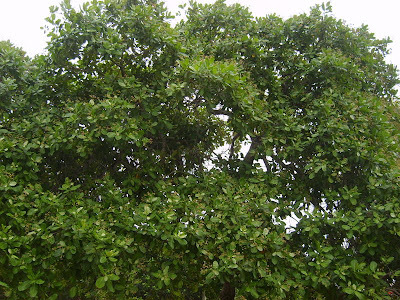 The cashew trees are very fast growing and can bear fruit in just two years. The plants can tolerate very poor soil and drought, but are very sensitive to cold temperatures. 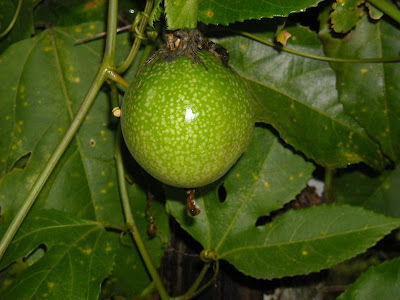 THE PASSION FRUIT: Passion fruit grows on a fast growing vine that climbs or attaches itself to some other body. The flowers are large, very aromatic and attractive to butterflies. The pulp is used in fruit juices or for baking desserts. 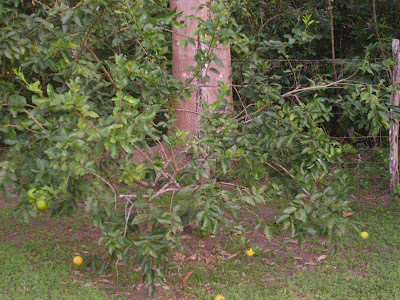 The variety in Dr. Crawford's garden in Crooked Tree is yellow, and about the size of a baseball. In a few weeks this fruit will be ripe for eating or making juice, and from her very own garden. TAHITI LIMES: These lemons are very acidic and juicy. 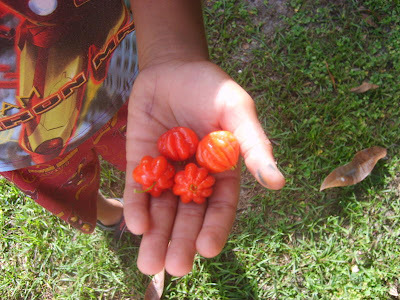 They have many uses in Belize, they can be used to flavor the food, as a garnish or for household purposes. They are ready to pluck when they are firm and bright yellow. One medium lemon has about three tablespoons of juice. This is a Pinguin patch in the garden of Dr. Crawford. 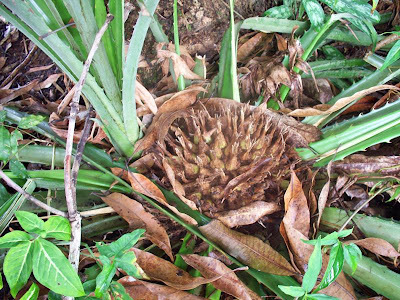 This Pinguin plant is actually a fruit, it is abundant in Crooked Tree Village, and is grown in the wild in patches that resembles pineapple. 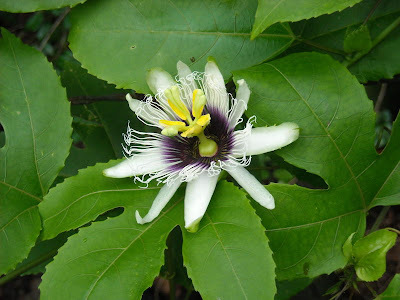 The plant is about three feet high with very long leaves, sometimes up to five feet, but are only about two or three inches wide with sharp spine edges. The fruit is in the center crowded together, but is separated, not joined like the pineapple. The Bromelia Pinguin is a native of Sinaloa, Mexico where it is used as food or a therapeutic agent. Before eating this fruit you need to brush or wipe off the brown, very thin stinging hairs. Then you need to peel off the tough outer layer to get to the sweet interior. Pinguin can be roasted over campfire or eaten raw, but be very careful because if you eat too many you can develop burn blisters similar to eating too much pineapple from the skin. In Mexico they make a very good juice from it. After gathering all the Pinguin from the patch, there are some fuzzy brown hair at the bottom. This brown fuzz can be used to stop a bleeding wound. If you are out in the forest chopping wood, and cut yourself just grab some of this fuzz and sprinkle it on the wound, it will stop the bleeding instantly. 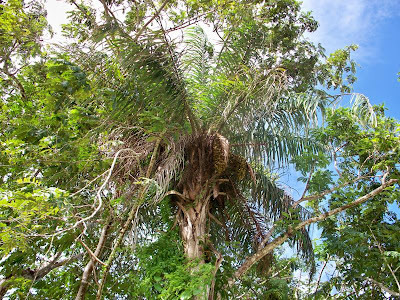 This is a Cocoyol Palm, but is know in Belize as Supa. The Cocoyol or Supa is a palm tree that is grown widely in Mexico and Central America and is covered with spiny prickles. 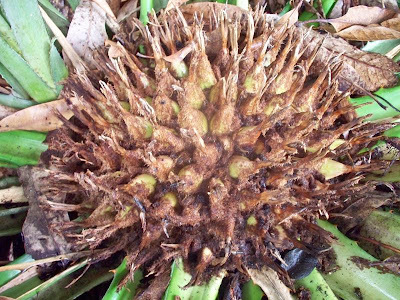 The fruit of this palm is cover by a thin shell, is grown on a bunch like coconuts, except there are about two hundred per bunch, are miniature, and maybe be eaten off the bunch. 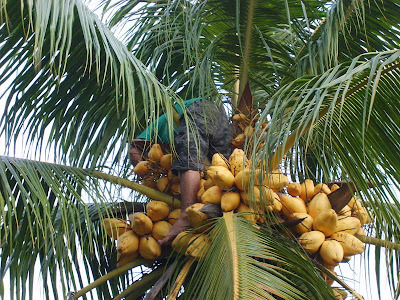 The task of taking them down from the tree is very complex because of the trees height and its thorny bark, but most farmers usually tie the branch that is loaded with the miniature coconuts and pulled them down. The nuts are then sun dried for a couple days before being made into a special Belizean treat. This stewed Supa is sticky, gooey, yummy, and will leave you licking your fingers for days! It is said that the appreciation for mango began in India and Asia over 4000 thousand years ago, but some of the best mangoes in the world are found in Belize. Mango is known by more people world wide than the peach. 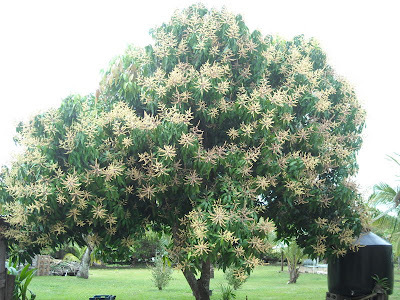 The mango tree is long-lived and can grow up to heights of 130 feet. The leaves are evergreen and broad. The flowers are small, in bunches and is lightly perfumed. The fruit can take up to three months to ripen. 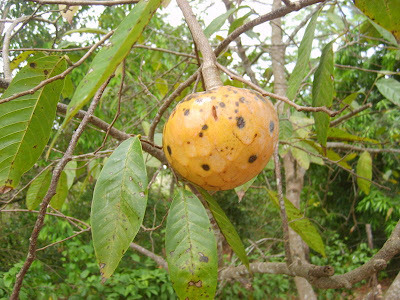 The ripe fruit varies in size and color and carry a single flat oblong pit that can be hairy on the surface. Mango is generally sweet, although the taste and texture of the flesh varies, some having a soft, pulpy texture similar to an over-ripe plum, while others flesh is firmer, like an avocado, and is consumed as raw or in desserts. Mango is best eaten fresh, it is full of vitamin C and is high in fiber. 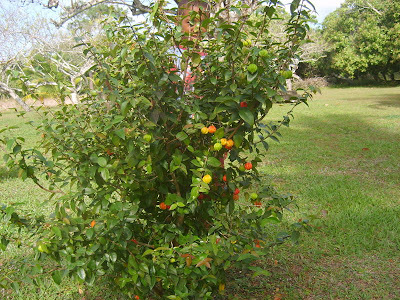 The Surinam cherry (Eugenia flora) sometimes known as Brazilian cherry or simply called cherry, and is not very common in Belize. 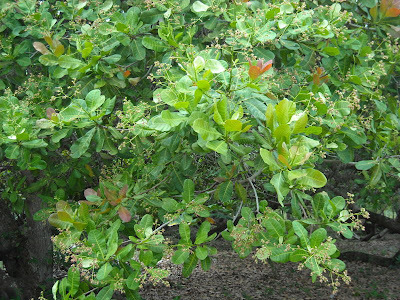 It is a small shrub which is sometimes used as a hedge or a screen in gardens. The fruit is orangish red when young and a deep red when ripe, thin skinned and juicy with a small yellowish seed. The skin is a bit tart but the rest of fruit is sweet, they are best left to ripen on the tree when just a touch will bring them down. They can be eaten fresh, seeded, mixed with a little bit of sugar or added to a fruit salad. The fruit is high in vitamin C and is used as a base and flavouring in jams and jellies, they also make a great substitute for strawberries. The coconut is an important member of the palm family growing up to 90 feet tall. The leaves are long and break away freely leaving a smooth trunk. The coconut palm is grown throughout the tropics and is used for cooking, decorating and a variety of other uses. And don't forget the water, it's very healthy and is an energy booster. The origins of the coconut is a subject of debate, some say it's a native of South Asia, while others say Northwestern South America. But what we all agree on is that the coconut palm thrives on sandy soils and is highly tolerant of salinity. It prefers areas with abundant sunlight, regular rainfall and high humidity for optimum growth. Poem in Creole by Hewart Tillett- memba this? I wish garden was the way you make it sound.....still has a way to go....wish I had more time to dedicated to it. This is a very interesting article thanks for educating us about the pinguin tree. Isn't there a song about this. .. Pinguin juck me etc? Oh you are making me homesick!!! Dellone and I were talking about the Pinguin patch less than a month ago!! Those are some lovely photos. You do such a great job sharing "home" with us. Thank you. I still need to listen to your interview!! Take good care of yourself. Wow, Dr. Crawford has an extensive garden............seems I need to start walking around at night. j/k. Seriously though, its nice to see someone who still has a variety of fruits, its getting rare these days. I would so love a Pinguin right now. I havent seen that in over ten years!!! I pray God will continue to bless you with all these knowledge that you are sharing with both young and old, very educational. Seems you are truly chosen to do good deeds. I enjoyed reading the finished product. "Miss Linda , you have done a really great job on the fruits from Crooked Tree Village, and it brought back fun memories of Michael ,Garreth and myself raiding the pinguin patches back in the days. Job well done, Please continue with those kinds of presentations." 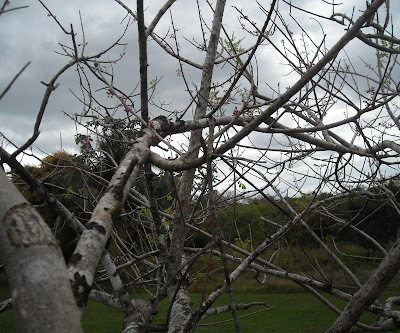 I miss home (CROOKED TREE especially) I would like some cashew wine (never had it before)...Thanks for always keeping us updated with back home..
What a fantastic job on the article about fruit trees blooming in our village. I especially love the piece obout the Pinguin. I will be in C Tree on Saturday for my birthday and I will be out hunting for Pinguin. Great idea now we're learning the real names for all these good fruits we have back home,thanks so much. Thank you for bringing back so many memories. As I was reading this, my family and I were laughing at the stories from my childhood. Thank you for educating the Belizeans descendants that weren't privileged to experience this wonderful life. Thanks for all this information, I can now share with my friends. The pinguin, I can't remember one as beautiful! Did you know that it also makes a very good wine? When we were kids in CT,they used to tell us the reason why our tongues would bleed is because of the knife and fork. Before you eat it, you have to remove the top, the knife and fork before you eat it. If not, you end up with a nasty cut! Thanks for the time and effort to keep us informed! Brings back childhood memories! Da long time me no se something like pinguin,me mouth done the wata from the sourness,lol,thnx fi all the info. u keep sendin from our home.